Two sets of twin chandeliers add eye-catching grandeur to the formal dining and living room areas. The winding roads that lope into the countryside east of Columbus are dotted with rolling pastures and equestrian estates. 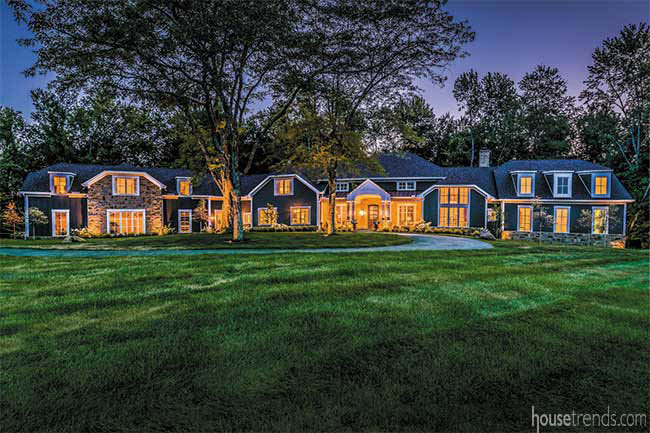 One such road leads to a little piece of paradise nestled among 31 wooded acres. 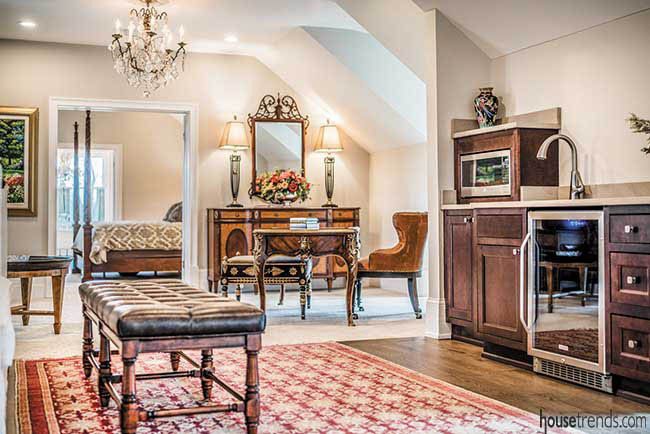 Formerly a modest English Tudor built in 1980, the home was sorely in need of a makeover, and Neal Hauschild and Jeff Ramm were just the people to tackle it. The end result is luxury living at its finest, where every room shines. Case in point: Golden sunlight from the outdoors is maximized in every room, and the layered lighting on the indoors is just one of many standout features. 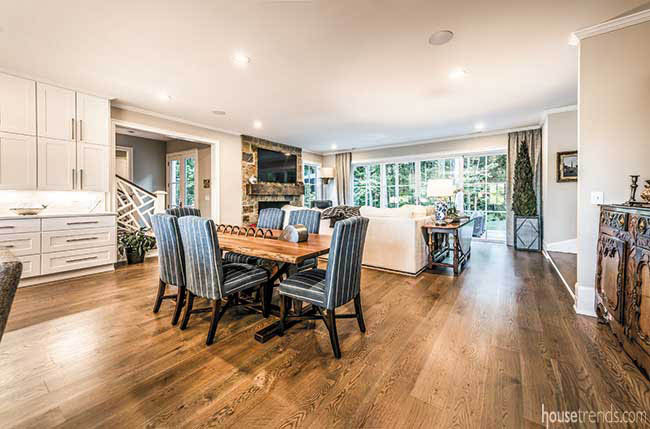 While Neal’s company handled the renovation, Jeff collaborated on design choices and the vision for the home. That vision involved a major structural revision, including removal of the second floor. One of the biggest obstacles they contended with was short ceilings throughout, so they dug beyond the original basement foundation to increase height. They also excavated and changed the terrain on one side to ensure ample natural light could filter through. “This process was not for the faint of heart,” says Jeff with a laugh. Neal explains that Jeff’s design preferences are usually traditional, but in this case, Neal pushed him to embrace a transitional and eclectic aesthetic, one punctuated by the aforementioned dramatic light fixtures. In fact, Neal creatively used lighting to drive the color palette, opting for muted blues and taupe hues throughout, such as in the great room, where dusty periwinkle and warm taupe furnishings exude comfortable elegance. Accent colors of silvers, golds and blacks add flair, along with pops of color, such as the vibrant floral arrangement on the dining room table. They also chose colors that complement the impressive collection of artwork. “We have acquired our art over time,” says Jeff. “Some are very traditional, and some date back to the 16th and 17th centuries.” This fresh approach to art is not unlike the melding of antique and modern furniture throughout the home. As an example, the contemporary kitchen table is a piece of functional art – made to resemble an old-fashioned wine bottle opener – and they’ve paired it with a traditional 17th-century French hutch. The table’s uniqueness is rivaled by the unique light fixture from Currey and Company that hangs above the island. 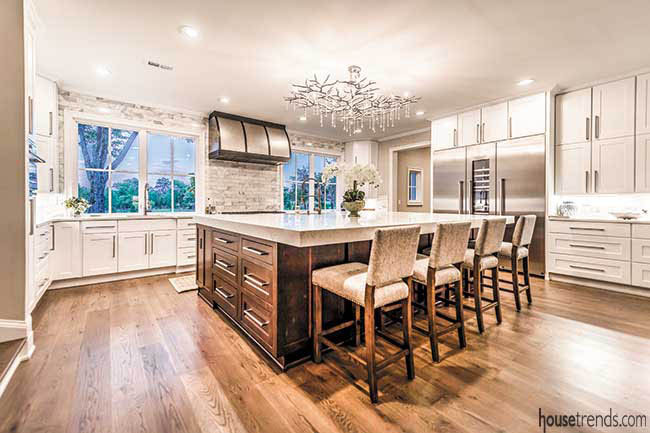 Neal took the bronze, tree branch-inspired chandelier, and painted it a stainless-steel shade to coordinate with the kitchen appliances, then added delicate glass tear drops for additional panache. The homeowners like to host soirees for charitable organizations, and this is when the scullery kitchen comes in handy. 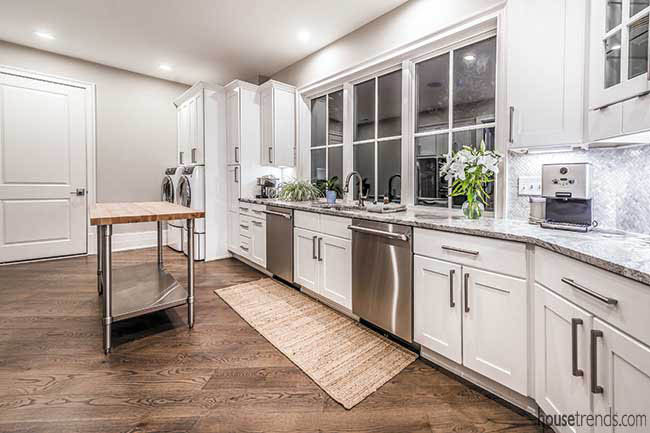 Caterers can conveniently enter the space from the garage, and then they have access to a wall of built-in refrigerators and ovens, a tremendous walk-in pantry, and then easy access to the main kitchen. During parties, guests can also spill over into the den, one of the original rooms of the home that remained intact, which boasts a white painted brick fireplace. 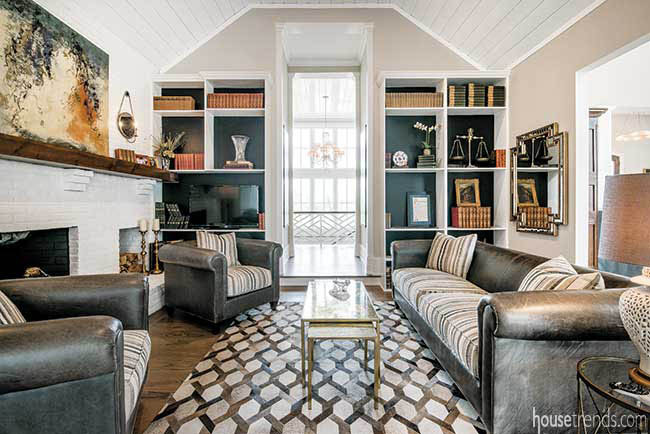 The den opens into the sitting room off the master suite, which has sustainable, built-in bookcases chock-full of antique books and treasured pieces. The custom-made marble-topped two-sided dressing bench is both aesthetically pleasing and functional, coming in handy for everything from displaying apparel to sitting and tying shoes. Just off the sitting room is the master bathroom and suite. 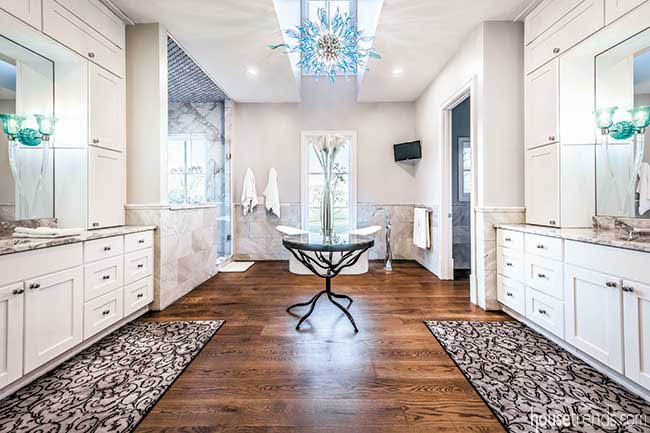 The former evokes old-fashioned glamour, with its freestanding tub, walls of Carrara wainscoting, and aqua glass sconces. A floor-to-ceiling window in the shower (visible only to deer passersby) allows for generous doses of morning light. In the master bedroom, light arrives in the form of a five-and-a-half foot fixture comprised of 300 crystal pieces, all installed by hand. “This is one of my favorite light fixtures that I’ve ever done, though the installation was challenging,” admits Neal. 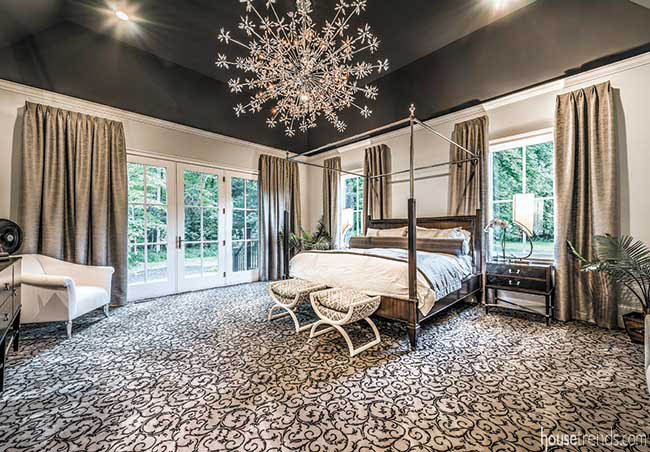 The homeowners opted for a dusky black vaulted ceiling, juxtaposed against the silver and black carpet. Modern light fixtures offset the room’s more transitional pieces, such as a Victorian hand-etched mirror. 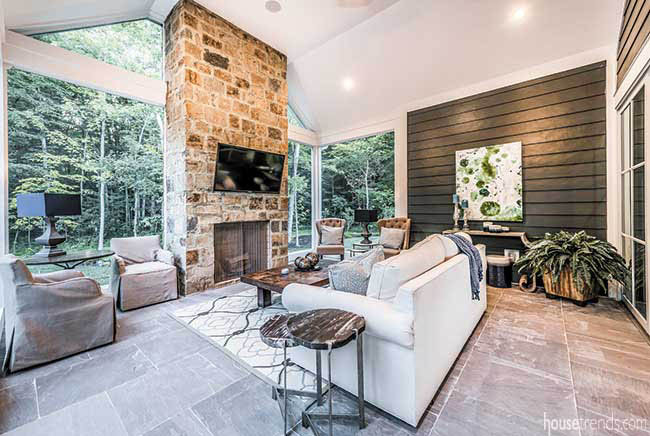 Not to be overlooked, the screened porch boasts a natural stone fireplace, mounted television and space for up to 60 people on the adjacent outdoor terrace. “The porch is my favorite space to have coffee, catch up on things and watch a little TV,” says Jeff. 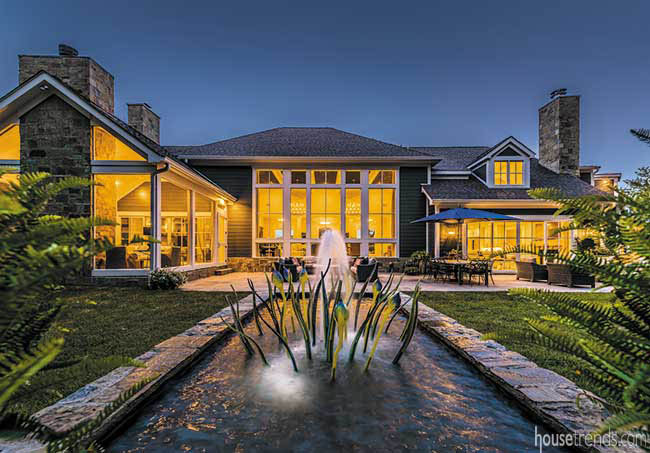 Both outdoor living spaces provide the ideal vantage point for viewing the courtyard fountain, which Neal designed based on inspiration from the Franklin Park Conservatory. The irresistible sound of water splashing on glass is constant; not only that, the fountain is perfectly symmetrical to the great room’s wall of glass and the home’s front door.